I’ve been sitting in my home office looking out the window, meditating on the sun glancing off olive tree leaves, considering what to focus on this afternoon in this space, this First Sunday after Trinity and this Octave of Corpus Christi. I’ve got multiple projects on my desk – pieces promised (two posts, two reviews), the final draft of Father Raynes’s Darkness No Darkness (an ACU reprint), a booklet reprint for one of our parishes, copies of The Magdalene Mystery to be sent to the Filipino priests I met in Rome, and lastly, my novel-in-progress, The Fire Trail, which I have returned to, determined to give it a couple of hours each day, but alas, not succeeding. Oh, and did I mention the brochure the Bishop asked me to help write and the Facebook site we will be setting up for our seminary chapel, St. Joseph of Arimathea? I could write in this space about any of these things that clutter my little brain, but which one or two or three? Suddenly, across the lawn loped a coyote, at least I think he was a coyote. He was slim, the size of a midsize dog. Long narrow snout. Darkish gray, like a deer. Clearly wild and headed across our front lawn and down the hill toward the base of Mount Diablo. Clearly focused. I suddenly realized how important choices were. I thought of all the ideas roaming in my head and how this coyote banished them in an instant. He focused my attention on his swift run through the plowed golden grass of the hill. He focused my attention on focusing. I wanted to run swiftly, on target, like he ran. We are bombarded with choices every day, ways to spend our time, ways to waste our time, ways to kill our time. With each choice, we move in a certain direction and are then bombarded with more choices. How does one choose? 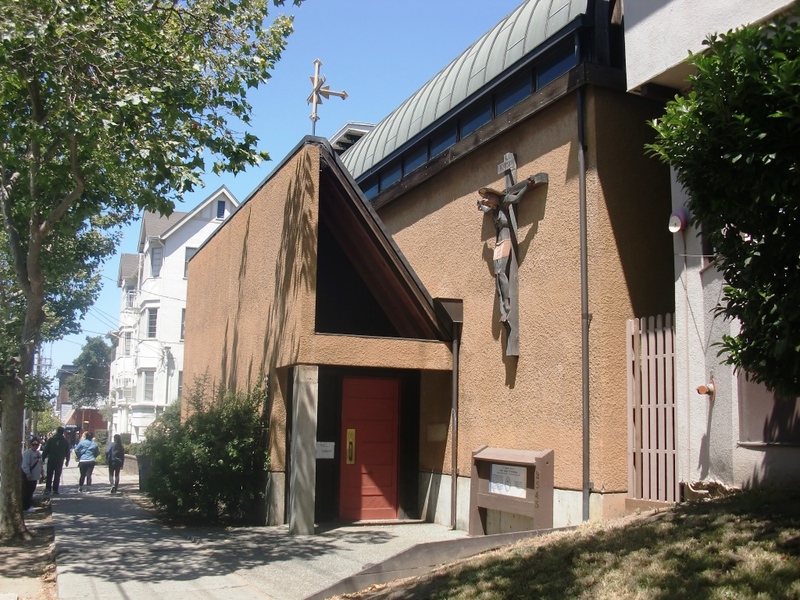 We attended St. Joseph’s today, our seminary chapel in Berkeley a block from campus. It was easy in that domed and tiled space to become focused, to not waste any of the hour given. The organ thundered as we sang, Alleluia, Sing to Jesus. The acolytes and clergy processed in with flaming candles and crucifix held high. The stone altar was alight with six white wax pillars framing the tabernacle. Soon we were praying together the familiar words of the Anglican Mass, poetic language going back to the sixteenth century. We listened to Holy Scripture and the preacher preached on the Feast of Corpus Christi celebrated this last week, the feast of the Body and Blood of Christ, the Real Presence of Christ in the bread and the wine of our Eucharistic celebration. We were focused in that hour. We had made choices this day, decisions not to go to the park, not to go shopping, not to have a late brunch or lunch, not to sit here and work on projects at my desk. We didn’t have to choose to get up early since the service was at 11:30, for which we were grateful. But we did have to choose to take a couple of hours out of our Sunday to worship God with his Body of Christ in Berkeley. And that choice made all the difference. It will make all the difference in my life this week, and it made all the difference in my life last week. Our preacher said that there was a time in his life when he he didn’t choose church, he didn’t choose to have God in his life. He chose other things to do with his time given. But soon he felt a deep emptiness in his soul. Soon he was hungry for God and it was a hunger that he couldn’t fill with other choices. So he returned to church, and I am glad for that, for he is a powerful preacher, bringing the intimacy of God’s love to each one of us. Choosing is like carving, with careful attention given to each shaving of the soul. We whittle away at our lives to create a sculpted image, the person that God intended and intends us to be. We need to be careful to carve in the right places, to choose no sometimes and to choose yes other times. So we need an educated soul, as well as a fully fed soul. We need God’s Word through Scripture and sermon, and we need God himself, through the mysterious miracle of the Real Presence in the Holy Eucharist. The coyote was heading for food and water, I am sure. Our choices are more subtle and yet just that simple too. For choosing God, choosing to worship and be fed and watered by him each week, lightens our darkness, and makes all the other choosings easy. I became, have become, focused, for life has come into focus, at least until my next encounter with God. This entry was posted in Uncategorized and tagged Berkeley, choice, choices, choosing, Corpus Christi, Eucharist, focus, ideas, Mass, St. Joseph's Chapel, Sunday, worship, writing. Bookmark the permalink.